Properties in Province of Brescia average 4.5 out of 5 stars. App. Lydia, terrace, garden, WIFI, disabled, private parking on the lake. Property 1: App. Lydia, terrace, garden, WIFI, disabled, private parking on the lake. 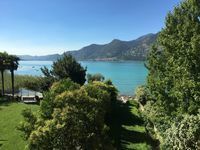 Property 17: Bright apartment in a quiet area, terrace overlooking the lake. Apartment with air conditioning, sea view, swimming pool, Wi-Fi, quiet hill, parking. Property 30: Apartment with air conditioning, sea view, swimming pool, Wi-Fi, quiet hill, parking. Property 44: Apartment for 4 people on the ground floor, nice and cozy. Property 50: AGRITUR VAL D'Egoi, MIRACLE NICE QUIET LOCATION IN EVERGREEN! Our apartment had a balcony with a nice view of the Lake. We had the First (euro) Floor Apartment. There is also a Second Floor Unit above us, and a house with gated grounds adjacent. Our apartment seems to have been remodeled recently. So everything was nice and new. Mary, our host, was very pleasant; she really wanted us to enjoy our stay. For future travelers, the building is located on the lake side of the railroad tracks (not actually on Via Covelo). It is very near &quot;Camping Covelo&quot;, and enjoys a cooperative relationship with the campgrounds. You can have any meal at their restaurant (seated inside or outside). Reasonably priced. We had dinner there one night, and were surprised at how good it was. We really enjoyed our stay in Maghy&rsquo;s house. It&rsquo;s a lovely apartment and very well equipped. The location is very central, it&rsquo;s close to many bars and restaurants and a few minutes walk from the boat and bus stop. Desenzano is a good centre from which to travel around the lake. Federica was most helpful from when we booked to the end of our stay. The only downside was a lot of street noise and church bells early in the morning.